Tad is deliriously mumbling ..”You are the best looking girl....the best kisser...” as Flick looks on! Dee arrives at Tess's and asks if she could please talk to Tess, and that is important, she just wants five minutes of her time. Dee begs Tess for five minutes of her time and that Tess owes her that much at least. Dee says that it is one of the hardest things...Tess gives her two minutes to say what she has to say and then go! Tad, Flick and Paul and the rest of the “kids” take their seats in the classroom. Tad picks up their next assignment the final one for the year and decides he might do it on a movie...”The Attack of the Killer Scorpion” The kids laugh but Susan is far from impressed. She thinks that recent events should have changed Tad's attitude but obviously not! She feels that Tad needs to take a good hard look at himself and that she will be discussing it with their families this afternoon. Susan then starts lecturing the pupils about their upcoming exams and the importance of them. How they need to take them seriously and that starting tomorrow they will be given mock questions to answer against the clock. Dee has just finished telling Tess all about Darcy. Dee pleads with Tess that they have always told the truth and that doesn't she remember their heart to hearts. Tess replies sarcastically that yes she remembers one particularly well when the lovely Alice had just told Dee a couple of malicious stories about Darcy. And that Dee was very upset and that Tess had taken Dee's side because that is what friends do! Lynn greets Tess and Dee and asks if Tess has butterflies. Tess smiles awkwardly and says she is fine. Tess says that Dee should leave. As she leaves Dee says that she only told the truth and that Tess was making a huge mistake. Lynn looks very uncomfortable and remarks how awful it is, but Tess shrugs off Dee's interference. and says she isn't upset. Karl is cleaning Darcy's shoes, Darcy tells him that he doesn't have to do that while he ties his tie. Karl says he wants Darcy to relax and enjoy the day. Darcy wants to know if Karl felt like this on his wedding day. Karl says No nothing like you he couldn't stand up. Darcy thanks Karl and Susan and says that if it wasn't for them he wouldn't have been able to get through the last weeks. Karl says that he thinks Darcy and Tess have a very bright future together...then laughs awkwardly. He realises Darcy thinks he is a bit of a stuffed shirt, but what he is trying to say is that he is glad to have Darcy as a friend as well as a partner. Darcy ignores the comments and asks if his tie looks OK. Karl goes to help with the tie and notices that Darcy has a stain on his shirt. Darcy says he thought only the bride had these last-minute disasters. Karl comments that there is nothing to worry about - salt will get the stain out. Darcy replies that he thought that only worked with carpets! Lynn is doing Tess's hair and make-up in front of a long mirror. Lynn says she doesn't want to know what Dee had said, she just wants to make sure her wedding day isn't ruined. It had occurred to Lynn that Dee might be one of those people who doesn't like to see their ex's with someone else. She feels that Tess should take what Dee said with a very big grain of salt. Tess agrees. Lynn thinks that the basis of a good lasting marriage is trust. She then says that Joe sometimes makes her want to spit but he has never given her any doubt to question his loyalty or his honestly. Maybe she is one of the lucky ones but he has always been straight as a die with her. Lynn then places the veil on Tess's head and moves the overall from around Tess's shoulder. Tess stands up and thanks Lynn. Lynn says that Tess is gorgeous and she is going to have a long and lovely life together and that loyalty and trust are the big ones she reckons. Lynn then apologises for having to rush off but she has a meeting at the school. Tess is left looking forlornly in the mirror. Tad, Paul and Harold come out of the classroom. Harold says he is rather surprised by the outcome not that he is condoning Alcohol at anytime. He is followed down the corridor by Joe, Lynn and Felicity. Joe is dismayed that they have been given a weeks suspension at this time of year. Harold feels that detention would have been more appropriate. Lynn says that is what they had tried to tell that snobby school council. Joe comments that it was Susan who insisted on the suspension. Harold feels that Susan is normally alright. Joe butts in that the power is going to Susan's head, just as Susan joins them in the corridor. Susan visible upset, advises the “kids” that the suspension is not a holiday and that they have their VCE just around the corner. They need to do their revision, finish any uncompleted work and that she will see them back at school in a week's time. She then excuses herself and walks off down the corridor. Joe says that is what we pay our taxes for. Harold feels that she is only doing her job. Felicity joins Tad and Paul and starts chatting to them. Joe is dismayed by Felicity's behaviour, he can't understand why she is chatting as if she is on a picnic. He feels that in his day he would have been ashamed. He can't understand what is happening, Steph has just seen “the love of her life” blown to pieces, Michelle is up before a magistrate for breaking and entering. Lynn butts in that it is for trespassing. Joe is dismayed and says, “Are these our kids?” Lynn replies that they are but not to worry and that they should get to the wedding that will cheer them up. Karl is dabbing salt into Darcy's shirt, Darcy is complaining that it is worse than when Karl started. Karl says that some stains have to get worse before they get better. He tells Darcy not to panic. Darcy is standing there bare chested and says at this rate he will get married like this. Karl feels that that could be interesting, but if the worst comes to the worst. Darcy could always wear one of his shirts. Darcy says that the shirt is a very expensive linen shirt, Karl says he has expensive shirts. Darcy is getting more and more distressed. Susan arrives home and is shocked that Karl is using salt on the shirt, she wants to know if there are any other condiments Karl wants to try. Susan dismisses Karl and sends him off to have a shower, she wants to know how Darcy is feeling. Darcy says he feels nervous. Susan says he will be fine and tries to reassure him, she goes off to find some cleaning fluid for the shirt. Darcy thanks Susan for all her support. Susan says she hasn't much choice as he is family. Darcy laughs and says apart from that, Susan butts in and says that all the thanks she wants is for him to be happy. Darcy says he is happy and it is all thanks to Tess. Wedding guests are dotted around the room in little bunches. Harold, Joe and Lynn – Lolly and Lou – Susan, Karl and Darcy. They look uncomfortable as the time ticks away and Tess still hasn't arrived. Karl makes a joke that “you might be wondering why I have called you all together today. But never fear normal transmission will resume shortly” Harold says the it is the brides right to be late. Darcy introduces the celebrant to everyone. The wedding guests and Darcy are still standing waiting for Tess to arrive. Lou is taking some photos. Lynn whispers to Joe that she has a bad feeling about this. Joe then tells Darcy to cheer up he isn't supposed to look like that until after the wedding his words trail off. Darcy wonders if maybe Tess has had an accident and goes to ring her on the mobile. Lolly whispers to Lou, then Lou proceeds to ask Susan on behalf of Lolly when the “Princess Bride” is arriving. Susan assures Lolly it will be very soon. Lynn calls Karl over and tells him that she doesn't know if this is important but Tess had a visitor this morning. Dee opens the door to Tess and asks isn't she supposed to be at her wedding. Tess tells Dee that she can't marry him, she has written Darcy a letter and Susan and the education department a letter of resignation. Dee is visibly shocked and invites Tess in but Tess declines the offer as she has a cab waiting. Dee says she didn't mean to destroy her life. Tess says that it is all right, that she had thought over what Dee had said and when Lynn had gone she had rang Alice. All what Dee had said is true, how can she marry a man she never knew. Dee is concerned where Tess will go. Tess says she is going to Sydney to visit her Mum, it would give her time to think things through and then maybe onto England. Dee asks if she did the right thing, she has been so worried about interfering. Tess says emotionally she is glad she did and just in the nick of time. Dee asks if she is going to see anyone else. Tess takes Dee's hands and says she couldn't face them but she wanted to say thank you to Dee and to say sorry. Tess had written a letter weeks ago to say that she had started seeing Darcy. Dee says she didn't get it obviously. Tess tells Dee that No she didn't because Darcy had taken the letter and told her he didn't want to hurt you and Tess had believed him. Then Tess had gone to the pub that night to tell her about the letter. Dee interrupts and says “But I wouldn't talk to you” Tess asks Dee if one day when this is all over maybe could you forgive me. Dee near to tears tells Tess “Of course I forgive you” and they hug one another. Both Tess and Dee are near to tears and very emotional. Dee asks Tess to keep in touch and Tess nods in agreement. They hold hands tightly and then hug and Tess breaks down in tears. Darcy is begging the celebrant to stay. Karl is on the mobile asking what time was this....he then thanks Dee and says Ok he will just have to tell Darcy. Karl tells Darcy he is sorry but it is bad news. Darcy immediately thinks Tess has had an accident. Karl assures Darcy that Tess is fine but he has just spoken to Dee. Karl explains that Tess called in to see Dee and is not going through with the wedding. Darcy laughs and says he is kidding. Lou, Joe and Harold say how sorry they are and what bad luck it is. Darcy says, “What is she doing?” Karl and Susan ask Darcy to come back to their house but Darcy declines the offer says he needs some time on his own. Susan hugs Darcy and Karl says how sorry he is. 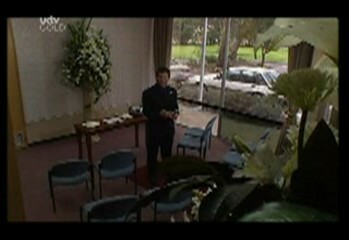 Darcy is left looking around the empty wedding room despondently. Lou and Harold are telling Paul and Tad about the wedding. Tad thinks it was a “Bummer” no party! Harold reminds them that people were very upset and Lou says the Darcy looked like he had been hit by a 2 by 4. Harold says he feels sorry for Tess it can't have been an easy decision. Paul and Tad wander off and Tad asks Paul if he has any ideas he says he thinks Dee has something to do with it for sure. Tad suddenly changes the subject and asks Paul if he has any theories on Flick. Paul is confused. Tad goes on to explain that every time he looks at her she freaks out. It is like he has turned into Dracula. Paul says he thinks it was the Truth or Dare game at camp. Tad says he barely remembers it. Paul reminds Tad that he had to kiss Flick and she probably thinks the he thinks she fancies her. Tad again dismisses the idea and Paul says that it is all he can think of. Back in the kitchen Lolly asks Lou for some ice-cream. Harold says he is spoiling her and then asks when the DNA test is due. Lou replies tomorrow he hopes and that the waiting is killing him. Harold asks he is in any doubt. Lou says he is the father all right but until it is officially confirmed that he is on tenterhooks. Susan and Karl go to answer the door, as Darcy arrives. Susan hugs him and asks if he is all right. He says he is and tells them that he has been to Tess's house and that it appears that she got cold feet....stage fright or something Susan says she seemed so keen the last time she saw her. Darcy wants to know what was said. Susan said nothing much she was just so keen and enthusiastic and excited. She doesn't understand what changed her mind. Darcy says she has been acting a bit strange the last couple of days. He then says that according to her note that she called Alice today. And you know what Alice is like. Darcy questions Karl about what exactly Dee said on the phone. Karl says it was a very brief conversation she didn't say much. Darcy says he loves Tess and he will do anything to get her back. Darcy starts to get distraught he says he knows she cares for him she said so in her note. There is no way she would never want to see him again. Susan tries to comfort Darcy and says that Tess wouldn't have called the wedding off for no reason. Marriage is a 100% life time commitment. If Tess felt she couldn't offer that it is probably best that she called off the wedding now rather than later. Darcy can't accept this, he says that she just got scared at the speed things were moving. He is going to find Tess and win her back. Susan and Karl looked dismayed.